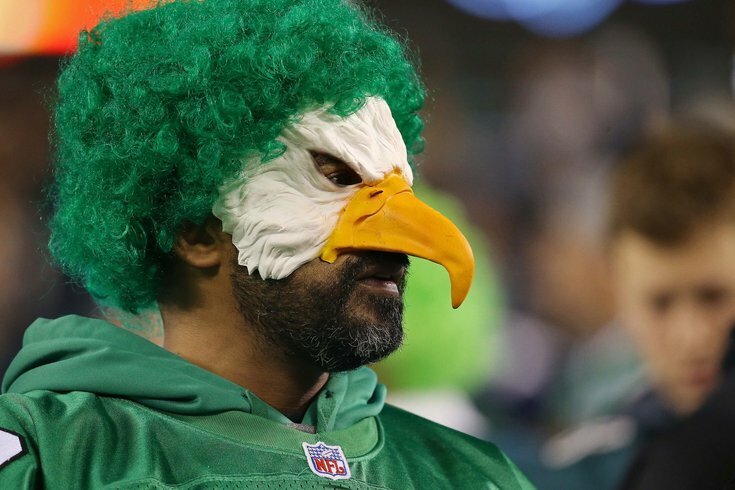 A Philadelphia Eagles fan looks on from the stands prior to the NFC Championship Game at Lincoln Financial Field. A lot has been made recently about the behavior of Eagles fans following their team's 38-7 win over the Vikings in the NFC Championship Game. Of course, that's to be expected any time a Philly team makes it to a championship, thanks to a decades-long history of incidents involving local fans, most of which took place over 20 years ago. Because it's the easiest narrative hook from which to dangle their clickbait, writers from other cities typically seize on any opportunity to make Philly fans look bad. And while I could list countless articles below from every corner of the country to prove my point, linking back to those stories would only help said writers achieve their goal of angering a rabid fan base and drumming up page views. Aside from the extremely rare exceptions, these stories come from outsiders, the types of people who fly into the city on Saturday, stay for a night and fly out immediately after the game, making it even more impressive that they have the time for sweeping (and inaccurate) generalizations about the fanbase. How, then, could they possibly get to know real Eagles fans, not just the handful of idiots screaming for attention (or perhaps professional help) by doing something as stupid as punching a police horse? The short answer? They don't. They get what they need from the worst among us and move on. That, or they willfully opt to forward a narrative they know to be false just for the sake of page views. Either way, Eagles fans seem to have had enough. And that's the theme of today's edition of What They're Saying, which starts with a local guy standing up for his fellow Eagles fans. I worked with Tyler in my previous life as an editor, and I can tell you from experience that this guy gets Philly. He was born in North Philly and although he now writes for a national outlet, he's never forgotten his roots. Tyler took a look at how this Eagles run has impacted several different fans from several different walks of life, and his story is definitely worth your time, whether you're a Birds fan or not. Memorizing the words to "Fly, Eagles, Fly" is a rite of passage for any young Eagles fans. In some cases, you learn to sing that before you even learn to read. And defensive end Brandon Graham proved he's no different from Eagles fans when he belted out his team's fight song on Monday at Super Bowl Opening Night – and even knew all the lyrics by heart. Moments later, USA TODAY Sports did put him on the spot at Monday’s Super Bowl Opening Night — and Graham nailed the song that is played after every Eagles touchdown and several other times during home games. Over at CBSSports.com, they offered up five reasons why fans should be rooting for the Eagles – don't worry, they did the Pats a few days earlier – and, unsurprisingly, the fact that this city has never won a Super Bowl was on the list. Philadelphia isn't completely devoid of championships. Although there are inevitably some same-state Pittsburgh Steelers fans who are bent on convincing you that any NFL games before 1967 didn't count, the Eagles were the NFL's top dogs in 1947, '48 and again in '60. And yet, for them and their hungry followers, the last five decades have done little more than tease a city starved for a trophy. Even the last great Eagles run, which saw Andy Reid coach the team to historic success and, of course, the club's last Super Bowl appearance against you-know-who in 2004, included a whopping four NFC Championship Game losses, three of which came back-to-back-to-back. With all that's been made about how player activism can be a distraction in the locker room, it's worth noting that it's had almost the opposite effect on the Eagles, who have some of the more outspoken players in the league.